Region: It’s hard to summarize the field, but you’ve written that there are three characteristics that differentiate Homo economicus from Homo sapiens: bounded rationality, bounded self-interest and bounded self-control. Thaler: Those are the three things that—in the terminology Cass Sunstein and I use in our book Nudge.—distinguish humans from “econs,” short for Homo economicus. But I’ve now added a fourth “bound” that we also need in order to have behavioral economics: bounded markets. If you had asked me in 1980 to say which field do you think you have your best shot at affecting, finance would have been the least likely, essentially because of the arguments that Becker’s making: The stakes are really high, and you don’t survive very long if you’re a trader who loses money. Region: And you found that investors overreacted to both good and bad news; also, they were overconfident in their investing ability. The implication was that market prices weren’t always right. In other words, markets weren’t necessarily efficient, in contradiction to the efficient market hypothesis (EMH). Then in 2001, with Owen Lamont, you studied equity carve-outs and found more evidence that markets aren’t good at estimating fundamental value. Thaler: Yes. Those papers highlight the two aspects of the efficient market hypothesis that I sometimes call the “no free lunch” part and the “price is right” part. De Bondt and Thaler, “Does the Stock Market Overreact?” was about the no- free-lunch argument. When we were writing that paper in the early ’80s, it was generally thought by economists that the one thing we knew for sure is that you can’t predict future stock prices from past stock prices. He goes on and talks about his work with the British government putting in successful ‘nudges’ and his relationship with Fama (they sit in mirror opposite offices at Chicago). He points out that when behavioral economics started with ‘bounded rationality’, a lot of the criticism was that it didn’t appear consistently or at the macro level. If you can’t aggregate the behavior, who cares? Well the more we investigate, the more important it turns out to be. I think neuroeconomics is in a similar stage – I’m not sure many economists really care, yet, because it will take time to figure out how to aggregate it. I wish I knew what Thaler thought about neuroeconomics. Anyone have a link to remarks of his on the topic? Here’s an interview with Shiller who is teaming up with Akerlof to write a book about manipulation and deception in markets. When an animal forages for food, it leaves it current location for what it hopes is a better locale. We like to believe that this foraging decision is made when the animal expects to get more food if it leaves than if it stays. Simple and obvious, right? Unfortunately for our intuition, this doesn’t seem to be the case. When I was at the Foraging workshop at Cosyne, one of the main themes of the day seemed to be that animals aren’t optimal foragers and they don’t look like our idealized rational economic agents, either. Let’s consider an animal that is forced to choose between different sources of food. Life isn’t easy, so it takes some time to gather the food from each source and after gathering it must leave the area before its allowed to gather food there again. The way this particular experiment happens to be set up, if our animal was an Optimal Forager that was trying to get as much food as possible, it would apportion its time solely on the easiest food source, ignoring the rest. Anything else is a waste of time and energy. And yet – and yet! – the animal doesn’t do this; it still will go gather food at one location, move to the next and gather food there, and move on again. 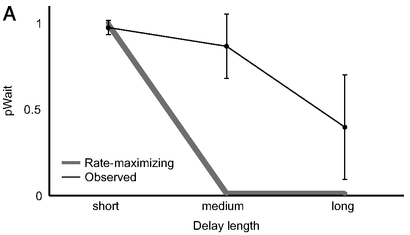 Look at how often (pWait) an animal will wait at a food source versus how often they should wait. It doesn’t exactly look rational to me. Okay, so maybe Optimal Foraging isn’t the way to go; maybe an animal doesn’t apportion its time based on maximizing food rate but uses some other economic criterion. Maybe it matches its investment and reward so that the more reward it gets from a food source, the more time it spends there? Data says nope. Maybe it is a temporal discounter and prefers rewards that happen sooner over rewards that happen later? Nope again. Let’s consider another option: maybe the animals get attached to the different options, or just like sampling different opportunities. What if we introduce a parameter into these different theories that represents an unwillingness to reject potential food options? This helps a little with the temporal discounting model but where it really shines is when added to the Optimal Foraging model. But foragers aren’t just always opposed to rejecting a food option. Rather, as the environment becomes more resource-rich, they are more willing to reject a food option when the environment is resource poor (low opportunity cost of time) than when it is resource rich (high opportunity cost of time). But does this tell us what we think it does? It seems like much of the effect is explained by the length of time the animal must wait for the longest food source; the length of the other options don’t seem to affect whether an animal will reject those options. This gives us another possible option: the task was just too easy for the animals. I would like to see whether the usefulness of the discounting model changes as everything gets harder and the environment becomes sufficiently ‘resource poor’, and also how animals behave when the basic optimal foraging model predicts something other than “always go to the easiest option”. The really interesting thing, though, should be: what genes are responsible for these behaviors? 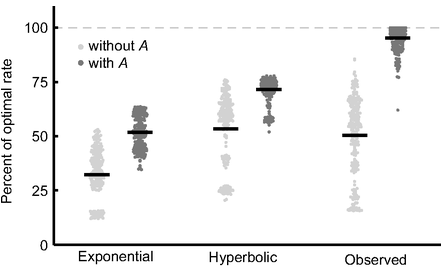 Are risk-taking and overall savings rate related to the same genes? How do these genes interact with the environment? A quick search reveals a relationship between 5-HTTLPR (serotonin transporter; how much serotonin is in the body) as well as DRD4 (dopamine D4 receptor, a D1-like receptor that is mostly expressed in prefrontal cortex, iirc) with economic risk-taking. But these papers are, hopefully, proof of principle for the economic community. If papers like this can garner some influence, maybe a broad behavioral economics community can arise that studies these genetics. God knows, listening to the first author of this paper talk makes it evident how much biology he needs to learn.